We are pleased to announce that ResOnline now send Check-in/Check-out booking restrictions to mapped Airbnb Realtime listings. On certain days like a public holiday for example, you may want either you or your staff to have the day off but still want to have guests stay at your property. We are able to edit which days a guest can either arrive or depart or even both. If you have no staff on the premises on a certain day and wish that the guest have to check-in prior and check-out the day after, all you need to do is contact ResOnline and we can arrange this for you. Please note: This can only applied for Airbnb, Roamfree and your own personal booking gadget. 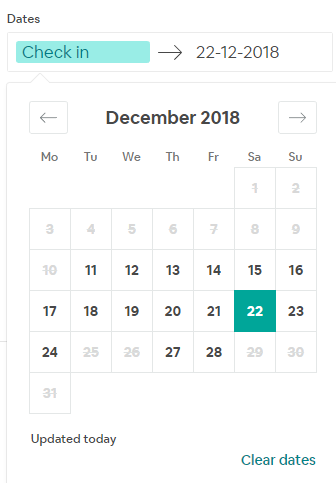 When a guest is making a booking you will see in the image below that they are able to check-in on the 22nd of December but are unable to check-out on either the 25th or 26th but can still check out on the 27th-28th. Please contact ResOnline Support via email with your Check-in/Check-out booking restrictions for each listing and ResOnline support will set these on your behalf. Please note: If Check-in/Check-out booking restrictions are applied on your ResOnline account, they will be sent to direct channels (your Resonline Booking Engine & Roamfree) and also to the specific mapped Airbnb Realtime listings once Airbnb sync is complete. This usally take up to an hour to appear on these sites from initial setup.